Clean Air in London announces its inaugural Clean Air in London Awards which recognise individuals who have made a valuable personal contribution to improving air quality in London. Bianca Jagger, Founder and Chair of The Bianca Jagger Human Rights Foundation, receives a special mention. “The Clean Air in London Awards 2013 recognise 24 people who have made a valuable personal contribution to improving air quality in London. “It is impossible to single out any one person. However, Bianca Jagger deserves a special mention for helping Clean Air in London to reach a much wider audience over the last year. For over three decades she has been a voice for the most vulnerable members of society, campaigning for human rights, civil liberties, peace, social justice and environmental protection throughout the world. Ms Jagger’s advice, encouragement and support for Clean Air in London have made a real difference. “It is tremendous to recognise also the contribution of many other people from across the political spectrum and from campaigners to scientists and business leaders. Individually and collectively, these wonderful people have ensured that air pollution is regaining the attention it deserves. “Clean Air in London is also pleased that Keith Taylor MEP has accepted an invitation to become an Honorary Founder Supporter of Clean Air in London. Keith is playing a key role in championing UK and European air quality during the Year of Air in 2013. Mr Taylor joins Jean Lambert MEP (Green), Sarah Ludford MEP (Liberal Democrat), Claude Moraes MEP (Labour) and Charles Tannock MEP (Conservative) and others who have been Honorary Founder Supporters since 2007. The Clean Air in London Awards 2013 aim to broaden and deepen the impact of the Clean Air in London campaign by recognising those who have made a valuable personal contribution to improving air quality in London. Existing supporters, sponsors and clients already make such a contribution and so have not been eligible for an Award. CAL aims to present the Awards annually. 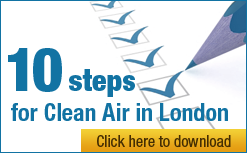 Clean Air in London will be pleased to present the Awards personally in coming weeks. Only senior politicians are eligible to become new Honorary Founder Supporters except in exceptional circumstances.